1	1	Silence	In Stock - Order before 4pm for same day dispatchWant it on Wednesday 24 April? Now a motion picture by Director Martin Scorsese, read the story of a priest facing persecution in 17th century Japan. For Christians, 17th Century Japan was a dangerous place to be in this highly-acclaimed novel by Japanese author Shusaku Endo. The story centres on the Portuguese Jesuit Priest, Father Sebastian Rodrigues, who embarks on a mission to Japan. After the recent defeat of the Shimabara Rebellion in which a number of Catholic peasants rebelled against the Shogunate, Japan's Christians come under a period of heavy persecution. For Father Sebastian Rodrigues this means resisting what his mentor could not: renouncing his faith, committing apostasy by stepping on a fumie (a bronze image of Jesus that was used as a test of faith, where suspected Christians were made to trample on the plaque or face execution or imprisonment). Trying to come to terms with why his mentor would commit such an act of heresy, Rodrigues struggles with what will happens when he himself will be commanded to trample on the fumie. Should he die for his faith, or trample and publicly renounce Christianity to save his own life? Set during the rule of the Tokogawa Shogunate, and just before the whole country closed itself off from the rest of the world, Silence is a historical novel heralded as one of the greatest accomplishments of Japanese literature in the 20th Century and an insightful portrayal of adversity and faith in Japan's turbulent past. 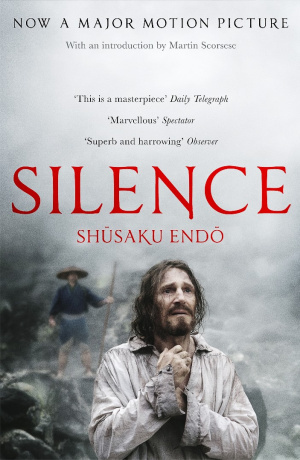 Silence by Shusaku Endo was published by Marylebone House in December 2016 and is our 15965th best seller. The ISBN for Silence is 9781910674277. Seemed like an interesting story with a real historical background.The book started really slowly and then got even slower.Very disappointing it was a trail to read the whole thing and disappointing ending as well. Waste of time unfortunetly.Also the concept is based in religion not a real relationship with Christ and that torture proves someones real beliefs?Very weird book. Take a peek at some articles related to Silence. Got a question? No problem! Just click here to ask us about Silence. Silence is Shusaku Endo's most highly acclaimed novel. It is the story of an idealistic Portuguese Jesuit priest, Father Sebastian Rodrigues, who in the 1640s sets sail for Japan. He is determined to help the brutally oppressed Japanese Christians and discover the truth about his former mentor, who is rumoured to have rejected 'glorious martyrdom' and apostacised. But, once faced with the reality of religious persecution, Rodrigues is himself forced to make an impossible choice: whether to abandon his flock or his God. Silence is not a novel with message. It does not proclaim or preach in manner similar to the missionaries of its historic setting, but rather is a stirring novel of questions that in their nature are unanswerable - all the while remaining a simple story of conflicted and desperate faith. When news reaches Father Sebastian Rodrigues that his mentor Christovao Ferreira, who was thought to be at work in 18th Century Japan, has denounced his faith and apostatised, Rodrigues travels to the secluded nation to discover the truth of this betrayal of faith. There, he discover a land turned hostile to the faith it had only recently come to embrace. Fearing for his life, Rodrigues is kept hidden from the authorities as he works to fulfil his fatherly duties, acting as a servant of the Church for the remaining Christians whose faith is absolutely outlawed. There he sees the unopposed cruelty which the Japanese officials mete out to anyone found practicing Christianity. Using a test called the fumie, by which the accused are told to step on a bronze image of the Christ to openly renounce, or disprove, the accusations directed towards them, scores of hidden Christians are exposed. Inevitably, the fumie is placed before him, but can Rodrigues find it in his spirit to faithful to a God who has met his suffering with silence? Along with this central conceit, Shusaku Endo masterfully balances questions of the complex relationship between the figures of Judas and Christ, and whether betrayal is ever the justified or right course of action; the unsettling question of whether there is a place where Christianity doesn't belong, whether any faith wholly alien to a nation's inhabitants can be truly followed without a distortion or tainting of it; and even the idea that our conceits of glory and martyrdom have, in themselves, diluted Christianity by placing the human individual upon a platform formerly reserved for Christ. Shusaku Endo's historical epic is a brilliantly captivating novel rich with authentic voices, an open mind, and - unlike almost every other portrayal of Japan - paints a picture of a land which is sodden, barren, and unforgiving; populated by people whose beliefs are complex, messy, and in profound conflict between the native Buddhism and the newly imported Christianity. Silence dares to bring to the fore the secret doubts and questions that we would prefer to comfortably avoid. Not so that we may feel overcome or dissuaded from faith, but that we would live in a manner that lowers our own self-made understanding - choosing not to proclaim a God we think we know, but rather, accepting the one we can never fully understand.